Friday, 22nd March, 2019 @ 11:00 a.m.
Saturday, 23rd March, 2019 @ 1:00 p.m.
Saturday , 23rd March, 2019 @ 2:00 p.m.
Full payment is due by June 30th. Coach leaves 8:30am from Guildford Mall. Prices and availability subject to change until booked. Our beloved father, husband, brother and dear friend left this world at 8:30PM on 12 Feb 2019, in the presence of his loved ones. As most of you know, the last six years of his life have perhaps been his most difficult. To see him pass in a peaceful setting and to leave this world with a gentle smile is a great gift to us, and is most deserving for a man of his character. His funeral is set for Wednesday February 20th, 1:30 PM, at the Valley View Funeral Home in Surrey, BC; followed by a ceremony commencing at the Lakshmi Narayan Madir, 8321 140th Street, Surry at 4:30 PM; then by a 13 day religious service at his home residence. Your support and presence means much to us during this time. One of many great things Meharam has imparted on us is a taste and appreciation for great music, particularly Hindi cinema’s golden years. We are sharing a YouTube and Spotify playlist of some of his favourite songs. I can still hear him singing these to us children on many a car rides. Playing these songs for my father has helped him in releasing and us in the grieving process. Meharam was a selfless man. In lieu of flowers, we ask that you donate on his behalf to a charity of your choice or to Seva Canada. We are sad to share the news of the passing of Ronda Schuler – a long-time member of the Association. In addition to any potluck item you might bring to share, we are also asking that you please bring a non-perishable food item for contribution towards St. Anne’s food drive. We appreciate anything you can donate towards this. We will have a gift hamper for raffling off as well as some other special prizes. We LOOK FORWARD TO SEEING YOU!!!!! In 2016 and 2017 we were able to send at least $500 each year directly to libraries in Guyana to help literacy initiatives. We have been able to partner with Guyana Book Foundation to ensure that those libraries got great value for the money; it allows us to spend in Guyana and thus help the economy; and it ensures that the materials are suitable for readers in Guyana. We all think that supporting literacy initiatives is incredibly important. 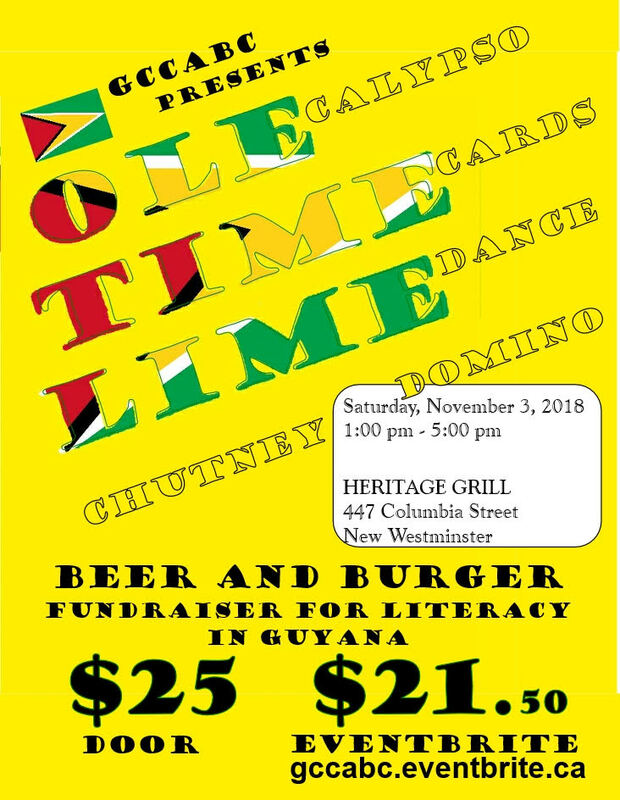 Event will include: Burger, Fries/Salad and a Beer for ONLY $21.50 if you purchase in advance through Eventbrite( https://gccabc.eventbrite.ca ). Tickets will be $25 at the venue, so you save a few dollars if you buy online (and it helps us plan). We will have music, dominos, and cards and we hope you come out and have a bite to eat and a mingle. Proceeds from this fundraiser will help the association meet their goals.